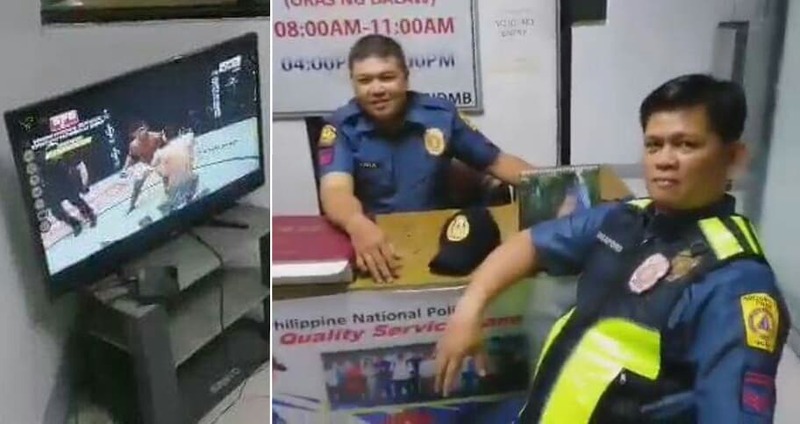 A netizen shared a bad experience they had at the QC Police Station 12, They were there to ask about an accident concerning their friend but the policemen were so engrossed at watching TV they felt disturbed when their attention was called, When asked if they're allowed to watch TV during work hours, he allegedly said, "Oo libangan namin 'to! A netizen took to Facebook to share the bad experience they had at the Police Station 12 of Quezon City. We learned that the netizen when to Eastwood QC Station 12, Bagumbayan to ask for a report as to what happened to their friend who met an accident at C5 Libis. According to the post of Mykey dela Vega, when they entered the said station, they saw 3 policemen watching TV. As his friend was in the line of sight of one policeman, the latter allegedly stated, "tabe-tabe." Having felt that she was rudely treated, his friend, who happened to be a girl, simply walked out. He tried to talk to the policeman but since the TV was blaring, he kept on repeating his questions, which apparently irked the policeman and he allegedly answered loudly, "Kung saan iyan iniwan, dian lang yan." At this juncture, he started to request that the TV's volume be lowered, but it was not heeded. He then proceeded to ask whether watching TV during working hours was allowed. The policeman arrogantly answered, "Oo! Libangan namin to! Hindi yan ilalagay diyan kung bawal!" Although he was not able to record that in the video, the netizen was clearly irked considering that they're people asking policemen an important matter about an accident.